An enchanting 1860’s Civil War era green and white cotton print dress. 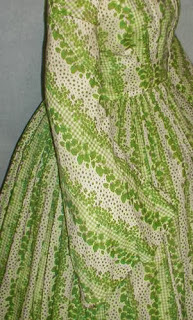 The fabric has a green dotted and green checked stripe patter. 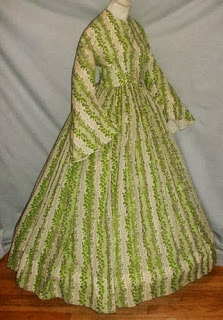 The stripes are surrounded by green leaves. The background color is white. 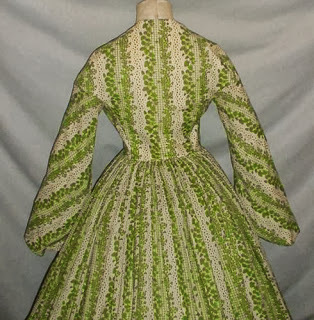 The bodice has pagoda style sleeves. The neck, armscyes and waist are piped. 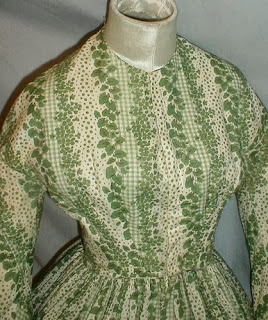 The bodice has a front brass hook and eye closure and is lined with cotton. 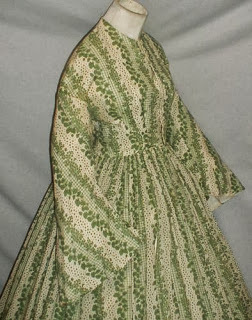 The unlined skirt is attached to the waist with cartridge pleating. The dress is in very good and clean condition. There is light underarm discoloration on the inside lining that barely shows on the outside fabric. There is one 3 inch period mend on the lower edge of the skirt. New hooks and eyes were added at some point but the original brass hooks and eyes are still present. A very bright and cheery display dress. 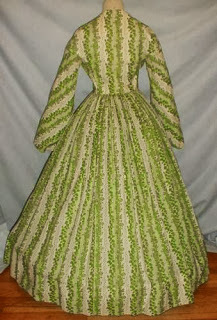 Bust 34 Waist 26 Skirt length 41 Width at hemline 146. This dress is best viewed with Firefox. The colors are faded on IE for some reason.